One of our readers recently requested that we look at Ambit Energy. They are a US based provided of natural gas and electricity. The company was founded in 2006 in Texas. Customers are referred to Ambit by a network of more than 250,000 independent consultants who are paid through a Multi-Level Marketing system. Ambit is about to expand into Japan and will so become another multi-national network marketing company. Here at The Finance Guy, we believe that you can't make money with network marketing, but we'll happily be proven wrong. Our review of Ambit Energy will take a detailed look at their business opportunity. We want to find out if this is a great way to make money, or just another MLM. With results like this we have no doubt that the company is turning a good profit. However we want to know if the consultants are making money from the business opportunity. The official Ambit Opportunity homepage, says it will show us how 'Ambit Energy Consultants are discovering Financial Freedom'. There's a 6 minute video on there which explains how this 'life changing opportunity' allows you to earn money every time people use either their gas or electricity. They also purport that Ambit is the right partner to help you take advantage of the deregulation of the energy markets. The video then tells us how well Ambit is doing and lists some awards that it has won. Including their placement on the DSN global 100 list. It's nice to know that the corporation is turning a healthy profit, but we want to know if this is a good opportunity for consultants to make money. Ambit then explains that their opportunity is superior to others we might have seen because everyone uses energy. All you need to do is give people the opportunity to save money on their power and gas bills. You can even show them how to get their power for free, all they need to do is refer a few friends to Ambit. Obviously what they are getting at is that every Ambit customer is also a potential Ambit Consultant. After all, nobody would say no to free power and gas, and most people would appreciate a few extra dollars a month. While this might sound well and good, we see it as an early warning signal. After all, when we looked at Dr Jon Taylors system for MLM evaluation, we see the first red flag is constant recruitment. If you want to set out on the road to financial freedom with Ambit Energy, then your first step is to pay the once off fee of US $75 to become an Ambit 'marketing consultant'. After that your only fixed cost is the $24.95 per month to maintain your Ambit website and access to all the online tools needed to run your Ambit organization. To help us better understand the opportunity, we also read through all 4 pages of the 2016 Ambit Energy Compensation Plan. Our research lead us to believe that the Ambit Energy Opportunity is unsustainable. We also found several read flags which gave us the opinion that most Ambit Consultants aren't making much money. You get another 2 customer points when you set up your 'business building website'. While not listed as a compulsory step, the $24.95 to run your website would also raise the pay 2 play flag. To be blunt, we don't believe that it costs Ambit admin fees of $24.95 per month to give you these 'tools'. At the end of the day all they are doing is adding you as a user to their existing system. If you open a Gmail account, you will also get access to a collection of Google apps such as cloud storage, a calendar and many more. If every new user costs so much per month, then why is Google giving all this away for free to several million people ever month? This bonus can best be described as a matching bonus. If one of your customers decides to become an Ambit marketing consultant, and they qualify for their $100 Jump Start 1 bonus, then you will also earn $100. The team builder bonus can be earned on every consultant you personally sponsor! When you first sign up for the Ambit Energy opportunity, your title will be 'Ambit Marketing Consultant'. To qualify for leadership income, you will need reach the higher levels in the Ambit hierarchy. You can get yourself promoted. To do this you will need at least 5 customer points (which you've done if you've earned Jump Start 1). You will also need to build a downline team of 6 marketing consultants (and have personally recruited at least 2 of them). Once you have ticked all these boxes you will automatically be promoted to the level of Ambit Regional Consultant. Once you have qualified at one of the 'leadership ranks' with Ambit, then you will be eligible to earn 'leadership income'. This is very similar to the team builder bonus except you can earn it whenever any consultant in your organization earns a Jump Start 1 bonus. It is paid to unlimited levels in your downline! As a new consultant if you qualify for the first Jump Start bonus, you will earn $100. The person who recruited you will get a Team Builder bonus of $100 and there will be $240 of Leadership Income distributed to people in your direct network marketing upline. What we see here is that Ambit is willing to pay a total of $440 in total bonuses if you can successfully obtain 5 customer points in your first 4 weeks. Only catch is that you only get $100 for doing all the work, and the other $340 goes to the upline. In other words you do all the work and get 22.7% of the reward. Here we see a combination of Red Flag 4 - Most of the Rewards go to your upline and Red Flag 5 - More than 5 levels in the payout plan. For every customer you personally bring to Ambit, you can earn from $0.05 to $0.30 per month in monthly residual income from their bills. 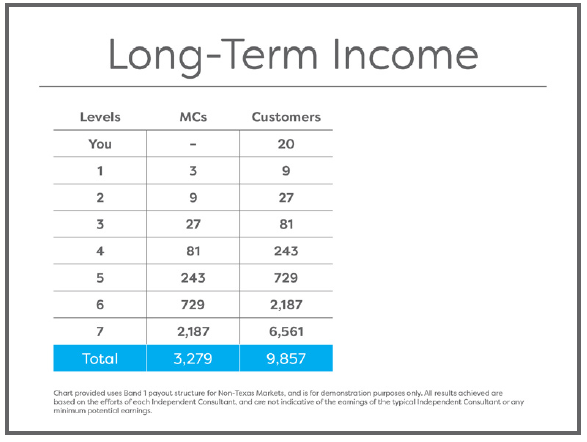 While this doesn't sound like a lot, the important thing to remember is that someone 7 levels above you in Ambit, who you've probably never met, is earning from $1.50 to $6.00 per month on the same customers. 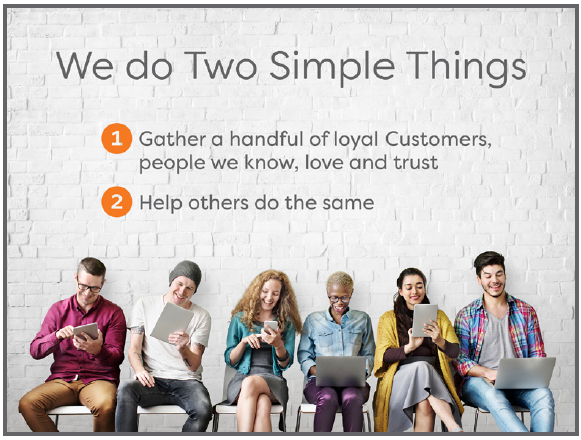 It's our understanding that when you sign a new customer to Ambit, a random stranger will earn up to 30 times more monthly income than you for the work you have done. If you know anyone who is an Ambit Energy Consultant, then it's quite likely that they've tried to sign you up as a customer and have invited you to see the 'opportunity'. In true network marketing tradition, it's quite possible that the business opportunity was presented to you and a collection of other prospective new recruits. Along with this video, we also read through a copy of the 2017 Ambit Energy Business Presentation Script. The script is a step by step set of instructions for how do use a powerpoint presentation to recruit new consultants to the Ambit MLM. It follows a similar pattern to the video above and shares most of the same information. Source: 2017 Ambit Energy Business Presentation Script. The presentations then continue to tell us how successful Ambit has been and that they intend to continue to grow. The company was started by a couple of guys we've never heard of before, but should be impressed by. It's nice to know that the company is turning a profit, but they haven't proven that consultants in the MLM are seeing good returns for their efforts. Next the business presentations moved on to the compensation plan. Explaining how much you can earn and how to get yourself promoted to earn even more. We've already discussed this so we won't go over it again. In our assessment of the ways to earn, we saw all 5 red flags. In the Ambit business presentation, they see it as a path to long term financial freedom. We believe that it is extremely difficult to make money with any network marketing opportunity. Essentially we think that MLM as a business model is designed to make you a customer, it is not designed to help you generate wealth. MLM has a bad reputation, which could explain why Ambit, and almost every mls company tells you that 'their opportunity is different from anything else in the network marekting industry'. We've heard that claim several times, but the opportunities always end up looking like just another MLM. Some common MLM claims made by Ambit is that they have 'the best compensation plan in the industry'. They also promote it as a simple system. Achieving financial freedom is as easy as 'gathering a handful of customers'. Ambit calls it 'helping others do the same', ironically they are doing the same as all other MLMs. We've seen the concept of 'duplication' in every network marketing opportunity we've looked at so far. In theory all you have to do is introduce a few friends to the MLM opportunity. Then they see how wonderful it is, sign up and proceed to tell a few of their own friends. As we saw in the Ambit business presentation, just introducing three new consultants can lead to almost $10,000 per month. The problem is that in practice, duplication simply doesn't work. It doesn't matter if you copy the exact steps taken by someone who was successful. There is no guarantee that you will achieve success of your own. It's important to remember that timing, market conditions and luck all play a part. Taking the same steps at a different time or in a different market might turn out to be unlucky. No matter how many times Ambit or any other MLM tell you that this is an opportunity to become a business owner, this simply is not true. Even if their presentation shows you Robert Kiyosaki's cashflow quadrant, it's still not an opportunity to be a business owner. If you become an Ambit Consultant, or member of any other MLM, you are an independent contractor. This is a role which is most similar to a commission only salesperson. While it's true that you can pick your own hours and determine your own income, you do not own the company. For one thing a business owner gets a share of company profits. As an Ambit consultant you get paid a commission on the sales you and your team generate. You are not entitled to any company profits. Another important thing to remember is that you do not have any control. Ambit decides what services consultants can sell and how much they get paid to do so. Ambit also has the power to terminate your agreement leaving you with no income at all. The Ambit presentations we looked at mentioned that $75 is lower risk and cheaper than any franchise. This is another myth we see in several network marketing presentations. They explain how successful franchises such as McDonald's have been. Then they tell you something along the lines of it's more profitable to buy a McDonald's then try and create your own burger. They imply that joining the MLM (Ambit or any other), will give you similar benefits to joining an established franchise. While the concept is similar to a franchise, there are some key differences which is why we think Ambit is not like a franchise. The main problem we have is with the constant recruitment. If you go into a McDonald's and order a meal, does the teenager with the 'trainee' badge try to convince you to start your own McDonald's franchise? If not then McDonald's is not like MLM. Franchises don't simply let new stores open at will. If you apply to purchase a franchise, then first you will have to prove that you have the skills to successfully own and manage the business. Then the location will have to be approved. These are important keys to the success of the franchise. Ambit will encourage you so recruit as many new consultants as possible, and then to 'duplicate'. If you started recruiting your friends and they started recruiting their friends. It wouldn't take long before you were competing with each other for new customers and new recruits. You will also be competing with Ambit consultants from other mlm organizations who know the same people you know and are trying to recruit them before you do. This is similar to the effects of market saturation. Every time a new consultant joins Ambit, they are in competition for new customers and mlm recruits with all the existing Ambit consultants. This means that the potential profits made by each consultant will decrease as more consultants join the MLM. This is probably why Jon Taylor found that less than 1% who join any MLM will turn a profit. We assume that the 1% who do make it, are those at the top of the pyramid. The problem with recruitment based models, is that there is no focus on the organic customers. People become fixated with finding the next consultant instead of finding the next customer. This means that a very high percentage of the 'customers' are also consultants. This is a problem because it means a large percentage of any bonuses you might earn is paid for by other consultants. The bonuses are included in your monthly bills so this means that only those near the top will turn a profit. Network marketing companies like to deny that they don't have many organic customers. We don't know the exact figures for Ambit, but have managed to find this Ambit training manual. Here we see that they are teaching new consultants that the key to success is in finding customers that can be turned into consultants. In other words they are fueling the problem. Ambit pays monthly commissions for every active customer in your organization. Some are paid to 7 levels and some to infinite. The problem for the customers is that all these bonuses are included in their monthly bills. When you join Ambit and become a customer, this means that part of your electric bill is going toward paying your upline. Given that some bonuses are paid to infinite levels, your bills will need to keep increasing as the MLM grows and more people above you qualify for bigger monthly payments from your bills. The main selling point we took away from the Ambit business opportunity presentation, was about deregulation. They showed how after deregulation industries such as telecommunications experienced a disruptive shift. It changed the way customers could access telecommunications and we saw lots of new companies offer a whole lot of new services. Several years after deregulation of telecoms, there are some players who have become Multi-Billion dollar companies. This is what Ambit want us to think of... Deregulation leads to new super successful companies. What we're not paying attention to, is the fact that for every successful business there were a few that failed, and no longer exist because they went bankrupt. The real pattern which we see when deregulation disrupts an industry, is that there is a huge influx of new players. In time most of them will disappear and only the few super successful ones will remain. As we've expressed from the onset, we are skeptical about whether the Ambit business model can deliver cheaper power. 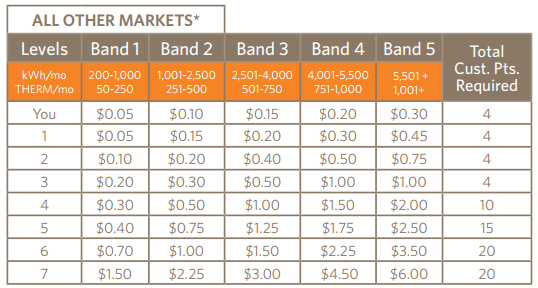 We looked at the Ambit rates and plans for Fresno California. The first thing we noticed in the terms of service, is that Ambit is not the direct provider of electricity or natural gas. Ambit does not have any infrastructure and is not generating any power. They are a sales company which buys power from infrastructure providers and then sells it to customers for a retail profit. What really concerned us about the Ambit terms of service, was that there is an arbitration agreement. Which suggests that Ambit is currently the subject of a class action lawsuit. The lawsuit which was filed in New Jersey alleges that Ambit uses deceptive tactics to hide the real cost of the energy they are supplying. This has lead to some customers being surprised with charges at the end of their discount period, that for some have added up to thousands of dollars. It would appear that New Jersey isn't the only area where Ambit customers (who may also be consultants) are opening unexpectedly high bills from Ambit Energy. There is a dedicated online Ambit Complains Board, where several customers from all over USA are sharing similar stories. We also found this detailed story of an Ambit consultant hit with a 'massive electric bill', a year after joining the MLM. Despite the similarities to pyramid schemes, network marketing is legal. If there is a product or service attached that can be sold to consumers, then the system is not illegal. By this definition Ambit is not an illegal pyramid scheme. Even though they are legal, we believe that MLM is an unethical business model. MLMs know that they strongly resemble illegal pyramids, and they do their best to play this down. Ambit is no different, we found their response to the question: Is Ambit a Pyramid? Here found the classic MLM response, which is that all companies are pyramids. It's true, there is a hierarchical system with a CEO at the top, then layers of executive followed by managers and finally workers. We are willing to agree with Ambit that most companies have a hierarchical structure, but we disagree that this makes all companies resemble pyramid schemes. When we look at the actual definition of a pyramid scheme, we see that the key element of a pyramid scheme is the constant need to recruit new members. That's where the difference is between network marketing and companies which don't resemble pyramid schemes. Normal companies only hire new staff to replace those that resign or when the company is growing fast enough to justify it. Ambit doesn't care how many consultants sign up because it costs them no hire them, and they only pay them for results. If they follow procedures and 'become their own first customer', it could be argued that Ambit profits from new consultants joining the MLM. Ambit, and all MLMs, claim that all companies resemble pyramid schemes. We obviously disagree, unless a primary part of every role in every company, is recruiting new employees. It could be that they've all made an honest misunderstanding. It could also be that MLMs want to mislead us to make their opportunity look better than it really is. If you want to save money on your bills, then make sure you compare all the available options. Also make sure to read through the terms and conditions before you sign anything. As we've seen, some deals appear to be good, but can end up costing you more over the longer term. If you are looking for a new business opportunity, then take your time to examine all your options. If you think you have what it takes to turn a profit as an Ambit consultant, then you can probably make even more in a regular sales job. One study found almost all MLMs are a waste of time. They found that your chances of success are extremely small. This because of the unrealistic expectations of a constantly expanding down-line. This review is based on the opinions we have formed while researching Ambit Energy. We'd love to hear what you think in the comments section below. Specially if you can share your own experiences with Ambit.